When we talk about love a lot of times it comes down about satisfying one’s needs. Yeap, in the down to earth approach people are looking to satisfy their needs and desires. They want to hear nice words, receive gifts, be treated like someone special, be the one and the only, be respected, be comforted, be assured. In one word be loved. This is not love. This is selfishness. And it is completely opposite to what love is. Love in its essence is giving. Is the ability to give, to be generous, not to expect anything in return. To love is to be vulnerable. To be vulnerable over and over again, even if the other deceives us. To love is to hope. It is to hope that what we give will be accepted and appreciated. It is not about the hope to receive the same gifts in return. Love is never fair. This is why it is wonderful. It is our amazing ability to hope beyond our rationality. And as the life shows, this hope is stronger and more powerful than any rational thoughts or acts. Real love always wins (if one can use the word win here). You just have to ask yourself if what you feel is love (i.e. an impulse to give) or is it a desire to satisfy your needs, to validate your feeling and to get the same in return. These are the two ends of the same line. You have to figure out where you stand. Is it 80/20 or 50/50 or 20/80? The greater is the first number the happier you will be, as the first one depends totally on you. This morning started at 6am with my son and daughter running around the house. They were excited to give roses to their teachers and friends. It is the Sant Jordi Holiday in Catalonia. As the legend says on that day a cavalier named Jordi slaughtered a dragon to save a princess. From the dragon’s blood red roses grew and Jordi gave one to the princess. 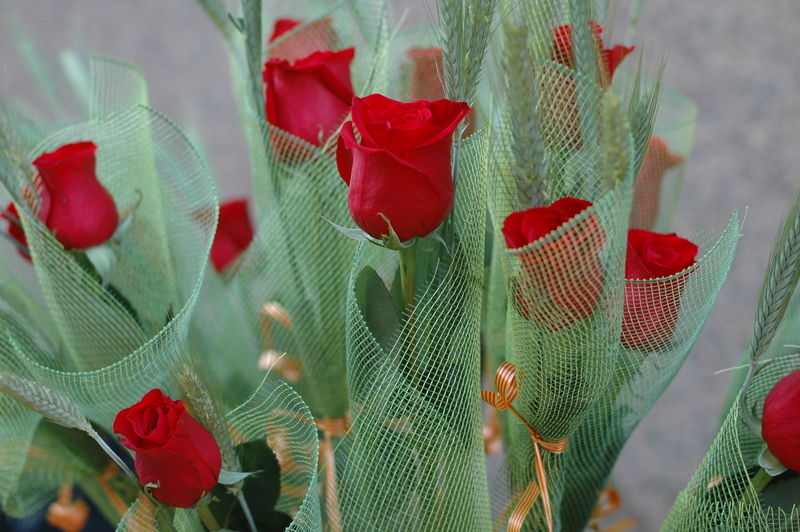 Since then, every year on the April 23rd the men give red roses to the women. Not just to the women they are in love with or married to, but to many women that are part of their lives. And women give men a book (sometimes), to remind them of the legend and the cavaliers. It is a beautiful tradition, because it is based on giving. My 3 year old son jumped his way to the daycare with two red roses in his hands. One for his teacher and one for his 2 year old friend Paula. He was extremely happy all the way there and he was extremely shy when he gave the roses to the ladies. It is ok to be shy. This is what to be a cavalier means, to do good things to others even if you are shy or afraid or unsure. As parents I feel we should learn to give with love. This is the only way our children will be able to do so too. Love (and giving) shows itself in small details, in our everyday life. It is not always easy to practice it. A lot of times we do not notice where we could give, we are too busy, too shy, too self-conscious, too rational. We also have to protect ourselves from the outside world, from others, and we wear our “street” clothing (our selfish selves) with a great smile and encouraging greetings. We become waterproof. We are aware of our needs and desires more than we are of love and giving. Once I take my waterproof jacket off, I know that there is one single feeling that is able to illuminate me from inside. It is also the most important thing is life Love. Note: As the author of this post, I have to add that this very morning I have been mean at least six times and more that I do not remember. To love and to give is not simple at all, it is natural for us to be selfish, but I think we should try to be better when we have a chance and can. If you consciously realize that you can change somebody’s day by giving (a smile, a rose, a nice word, an orange, a gift, some help), then do not shy away, do it! Sort of as a monthly experiment! I will do so too. 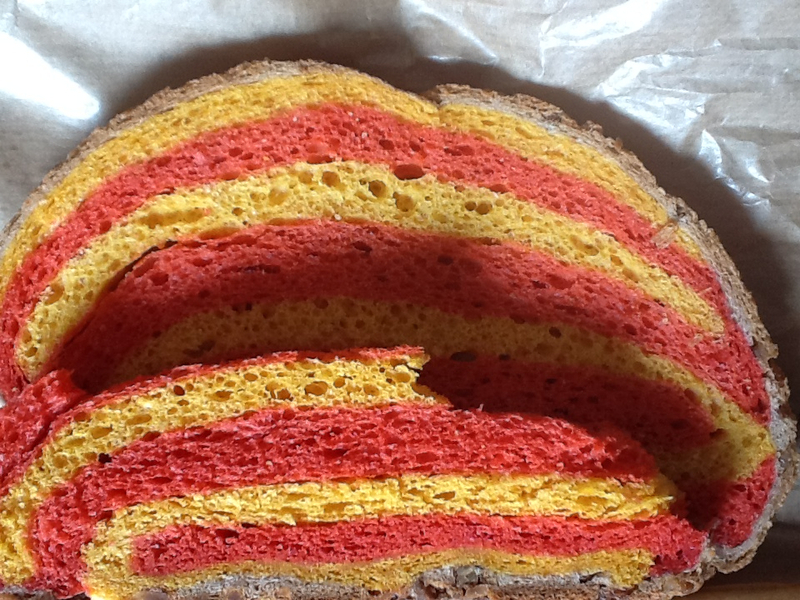 This is just a regular piece of bread, however, as the Sant Jordi holiday is approaching all the bakeries in Barcelona sell El Pan de la Diada (on the picture above). It is done with cheddar and morcilla (blood sausage). Overall it has a sweetish taste and if you close your eyes you will eat it as any other piece of bread. Here is a random thought about love. I was searching for an old email in my mailbox this morning, and reread one that ended with the word love. This simple word at the end made the whole email intense and warm. When we add love to something we intensify the meaning, we make each word count more, we offer the feeling of home to the person on the other end. It is interesting to see how the meaning of the message changes if we sign it with hugs, yours, take care or just with our name. Still love is just an intensifier. Without the subject, the message, the thoughts the word love by itself would not count. Well, may be it would ocassionally. Imagine you receive an email or a message with just one word love. It would make you smile and feel great at the beginning, but if there is nothing behind, the world by itself will become boring and everyday. The word love is empty by itself, however when the message is there it has an amazing effect. It becomes the most powerful, beautiful, desired and encouraging word one can give or receive. The same goes for the picture of the bread. I sent it to a friend in Russia and she found it wonderful and loved the colors. Colors are intensifiers of our emotions. What we label as love are the new colors that wake up our imagination and curiosity. And there is nothing wrong with it. I still believe that in a way life and love are about sharing the wine and the bread. And it is about smiling while eating. I have been listening to this song for the past days. I kept it open on my laptop, and every now and then, when my eyes got extremely tired from typing or reading, I would take a break and hit play. I found myself walking on the street this morning and singing this song inside my head. And smile. Like an idiot. And be very vulnerable. Our live makes us numb a lot of times. And numbness is a very comfortable feeling, it covers us with a sort of security blanket and protects us from the outside world. As human beings, we need it. We long for the assurance that nothing will hurt us out there. We need to know that we will be fine. The only way not to be rejected is not to give anything. This need of security keeps us from telling how we really feel. It prevents us from being the first to say you matter, I love you, with my heart and soul I believe in this, I am passionate about what I do, I love poetry, I cry when I listen to this song, I need help, you are beautiful. This security prevents us from believing in others without expecting something in return. What if they do not reply? What if they say no? What if they do not even notice me? And a lot of times they will not. And it is fine. However, the strength of your love and your ability to see the light in others is what really matters. This morning making my son’s bed I thought about what it means to be a mom of a boy. It means finding lots of trains and airplanes in his bed. I am still wondering how does he sleep with all these transportation devices. Exactly 3 trains and 11 airplanes. It means feeding him breakfast while he circles in the kitchen with his tricycle. Almost a drive-through kind of thing. It means inventing stories about tractor Mitia that only eats meatballs, but sometimes gets lost in the forest and has to live on the berries and mushrooms. A new story every meal. It means hearing him debate with his sister that I am only his mom. He loves his sister, but he does not want to split his ownership of the mom. And then “my mom” pronounced in his sleep at midnight sound like the softest and kindest words somebody ever said to me. It means fixing his broken railroads while he is at the daycare. I should be working in these productive hours, but I take 15 min to fix his railroads and the airport, so he gets excited when he comes home. It means singing a song to him when he asks for it. Even if we are on a bus or in a cafe. Does not sound like a big deal, but if you ever hear me sing, you will know why I would not do it under any other circumstances in a public place. It means not screaming when I see him standing on our dining table with a broom in his hand trying to hit an Ikea paper sphere lamp on the ceiling. It takes a breath to tell him, “Miro do not do it” and hug him and put him down on the floor. It means letting him grow; Telling him medieval stories of cavaliers, princesses and noble men. I often find him fighting imaginary dragoons to defend mom or a princess. It means telling him about love through the story of The Little Prince. It means to show him through love how to be independent. I love him as a mom, I love him because he is my son. And I will love him independently on who he becomes, what he does in his life or what he does not do in his life. This power of love will make him strong and independent, it will let him become whatever he choses to become. It will be with him for the rest of his life. It will be the base for his integrity, kindness, passion. And I believe that if I love him in this way, he will become all that. He will have the spirit of a Man. 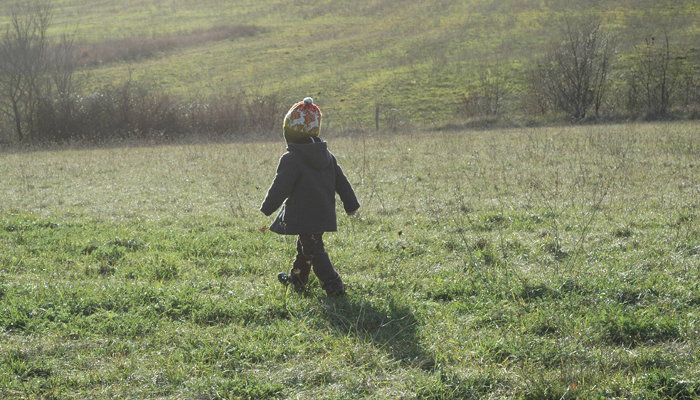 Being a mom of a three-year old son is not about protecting, feeding or taking care of him. Really it is not, those are just tasks that anybody can do. It is about giving him the freedom to grow into a Man. To show him that he is strong and passionate and gentle. To read him the lines that say that he is a part of the mankind and that his spirit is noble, not for himself, but for others. It is about passing him the love and light that will always be in his eyes, and that will make him act like a Man under any circumstances. Being a mom of a boy means to be really thankful for everything he shows me in this world and within myself. Many times I hear people say, “Love me for who I am”. Driving along the Languedoc austere roads in the silence of the hills made me think of the rightness of those words. Does it mean that if you do something unexpected, something that goes against your nature, I should stop loving you? No, I should not. I love you for who I am. Not for who you are. I thought about it. I do not believe that we love people for who they are. We love them for who we are. It is our ability to love, to pardon, to be sensitive, to be compassionate that matters. To certain point it really does not count that much how the other person is. I will love you as much as my own belief in nobleness of human nature goes. I will love you to the extent that I am able to believe in love. In the midst of loneliness I find love within me. And this makes me profoundly happy; The notion that no matter what happens there is something stronger inside of me fighting for the light. And I will love you for who I am. What we love in others is our own ability to love. We love our own strength, our nobleness our understanding and compassion. We are attracted by the riddle of how much others will love us for who *they* are. Their love is about them, our love is about us. And there is nothing wrong with it. It is actually amazing. It gives us the power. Independently of how great, awesome or successful we may be, let’s be honest, we do care when other people love us. Yes, we may not care what others think or talk about us. I personally do not care what people around me say, I am sure my life in their words sounds more extravagant than it really is. A smile goes here. But I do care when people love me. At least when certain people that are important to me love me. We all care. You care too. It is the most natural human feeling. Thus, when it comes to love, do not love me for who I am. Love me for who you are. And I will do so too. 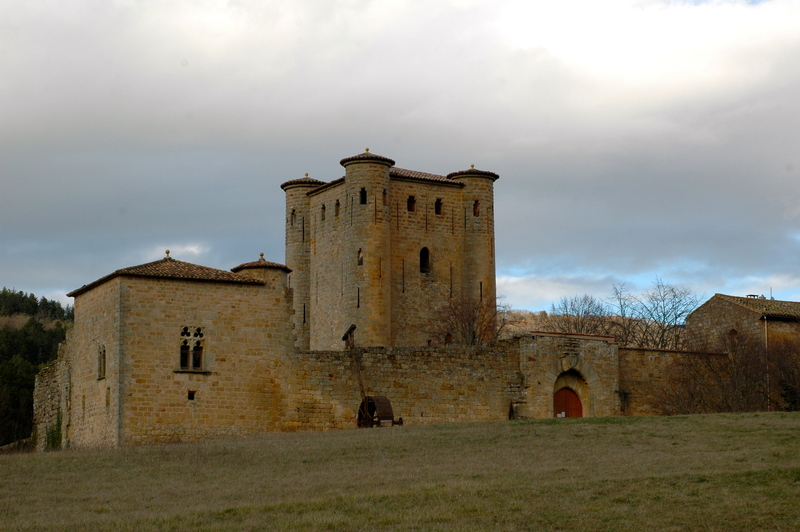 Both pictures in this post are of Le château d’Arques (Southern France). The château itself has little to do with what is written here. 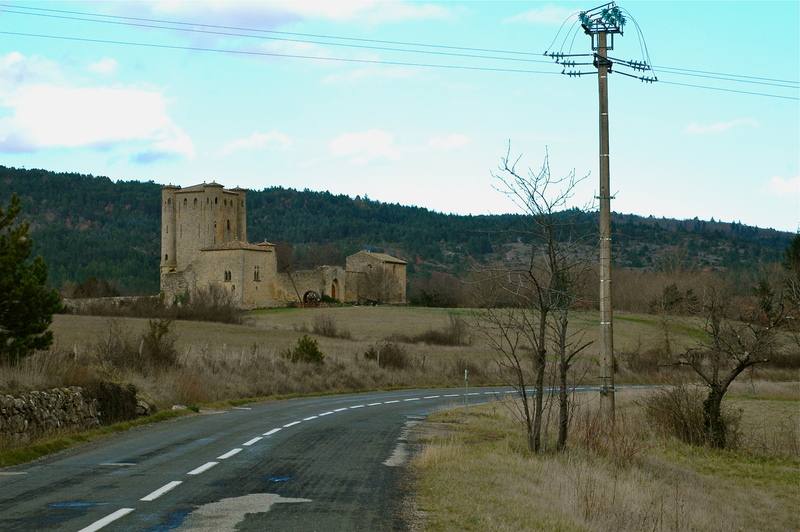 It was the silence of the hills that surrounded it and the cold February air that influenced my thoughts while driving slowly along the Languedoc roads.